Credit Union Official Shot Dead In Artane. (R63)..1987..25.08.1987..08.25.1987..25th August 1987..While depositing takings in the night safe of Allied Irish Bank in Atrane, Mr Michael Thackaberry was confronted by two armed raiders. The raiders snatched the money and made off on foot. Mr Thackaberry gave chase and was gunned down by one of the raiders as he attempted to recover the money. 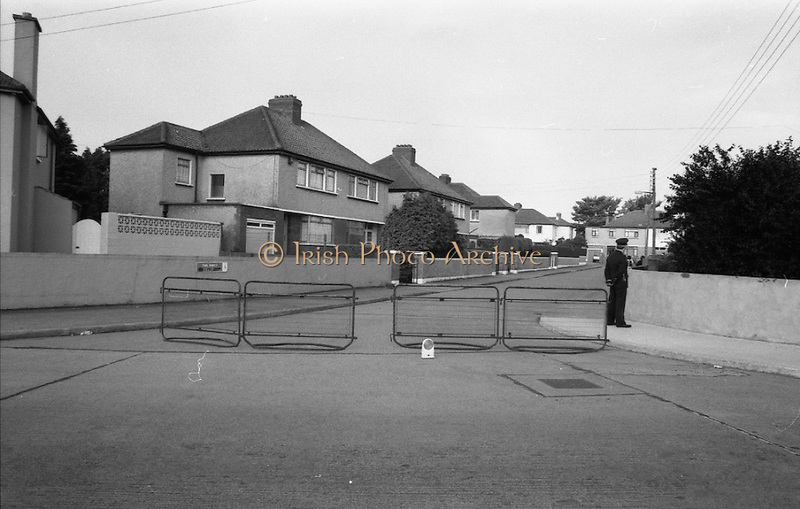 Mr Thackaberry died at the scene of the shooting...Picture shows a Garda standing watch at Danieli Drive, Artane, the scene of the shooting in which Mr Thackaberry died.